Hildesheim: Market Square, 3.5 mi. Hildesheim: Hildesheim University, 3.5 mi. Anderten: Traffic Autobahn A7 AS Hannover-Anderten, 11.3 mi. Ahlten: Traffic Autobahn A2/A7 Kreuz Hannover Ost, 13.7 mi. Völksen: Völksen / Deister WeatherCam, 14.7 mi. Hanover: Hannover Misburg, 14.9 mi. Salzgitter: Salzgitter-Bad Market Square, 15.7 mi. Salzgitter: Pilgrimage Church Engerode, 15.7 mi. 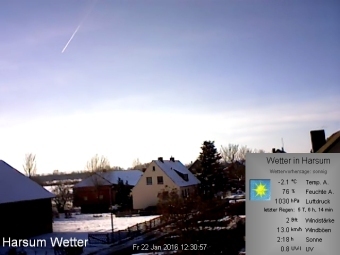 This webcam Harsum with the theme Weather was added on January 29, 2014 and is operated by udo-kling.de. It got 1287 visitors since then. Shouldn't this webcam work or should the link be wrong please report that here. You can add this webcam here to myCams.